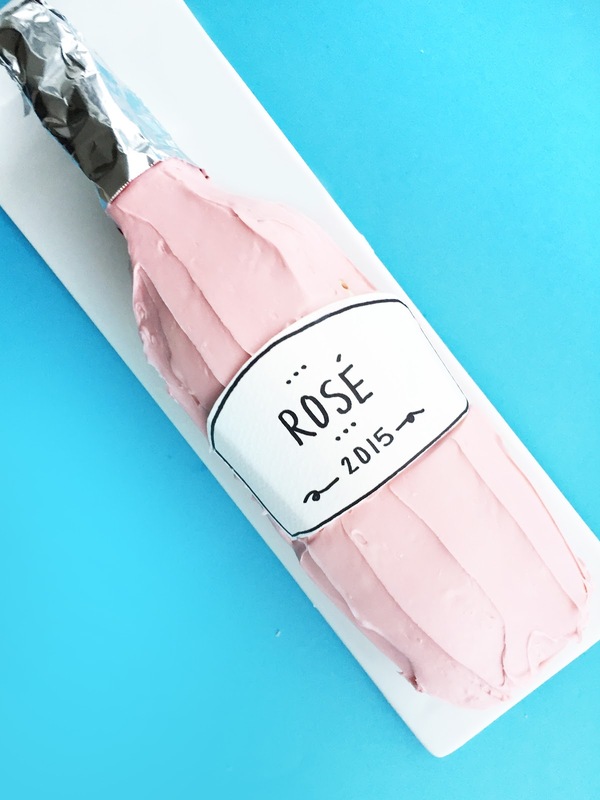 Rosé Wine Bottle Cake! / Hey, EEP! First, you should go to the wine store and buy a few bottles for research purposes (wink, wink)! But seriously, go to the store or hunt around online to get a sense of the kind of label and bottle shape you'd like. Even though you think you could make a wine bottle shape freehand...I'm telling you, it's way harder than it looks! I suggest tracing a bottle to create a template. You're going to use this template to cut out two piece of confetti cake from a 9-by-13 inch baking pan. It doesn't matter if your template's longer than the cake. You can cut out the neck from the scraps. 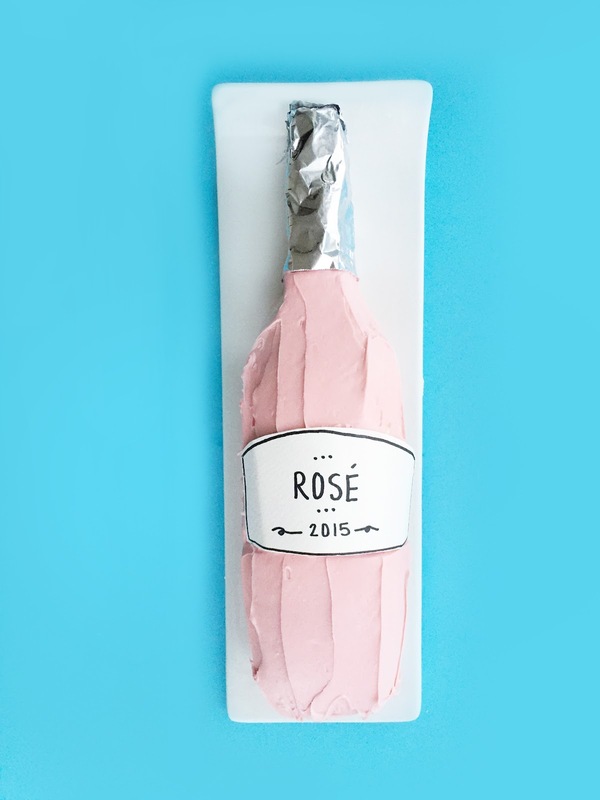 You can totally go full-blown confetti here but I chose to give my bottle a mouthful of classiness by using rosé instead of water to make the cake mix—BAM!—and I added strawberry preserves to my frosting to create a quick fruit filling. By all means, do as your heart desires. 1. 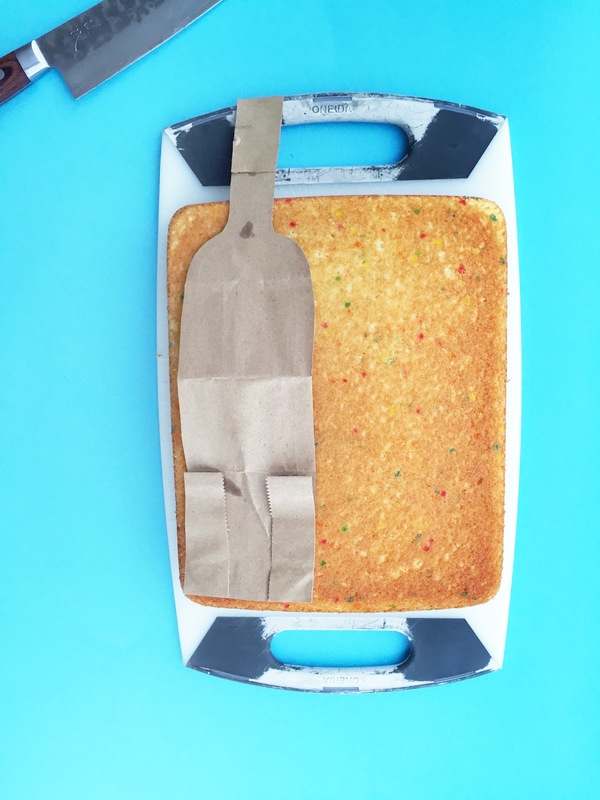 Transfer your cake to a cutting board; trim to flatten, if needed. 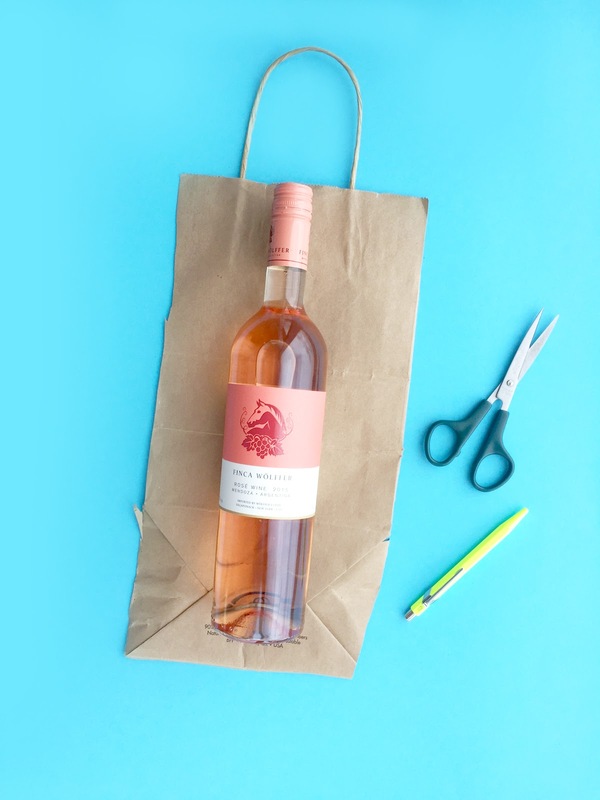 Trace the wine bottle on a grocery bag using a pen. Cut out your template with scissors. 3. Place 1 bottle layer on a serving plate. Top with frosting using an offset spatula. Gently place the remaining bottle layer on top. Cover the entire cake with a thin layer of frosting (this is your crumb coat) and refrigerate at least 30 minutes. 4. Meanwhile, tint whatever frosting you have left using the gel or liquid dye. Create your label design on the cardstock. 5. Remove the cake from the refrigerator. Cover with the pink frosting, working around the curves of the cake. Use the offset spatula to create the illusion of a rounded edge: Hold the spatula at an angle and make long, beveled strokes at different angles, working your way around the cake. 6. 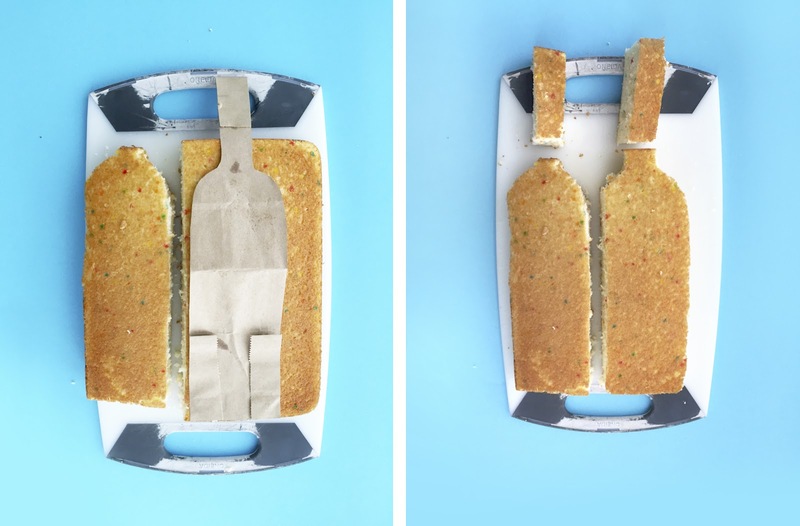 Cover the neck of the cake with a small square of aluminum foil. Press your cardstock label into the frosting. Refrigerate until ready to serve. 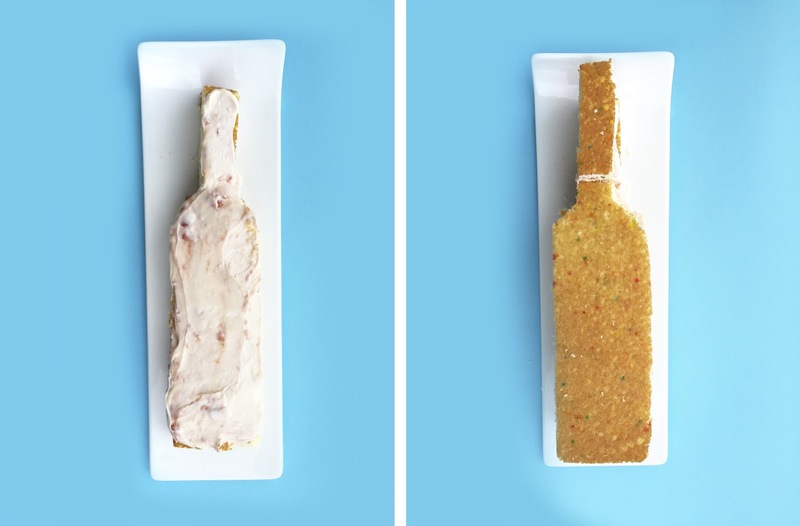 TIP: Use this same technique to create red, white or sparkling wine cakes, too!